I would like to share some news from the SAP on Db2 development team with you – we have a useful small new tool for you, new documentation, and new recommendations for SAP BW on IBM Db2. 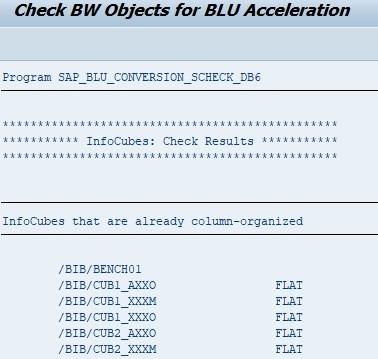 With program SAP_BLU_CONVERSION_CHECK_DB6, you can now check whether a BW object can be converted for BLU Acceleration. We created this program based on a request coming from the German SAP users’ group (DSAG), and we are happy to announce its first version is now available with SAP Note 2532409 . Call transaction SE38 and run program SAP_BLU_CONVERSION_CHECK_DB6. 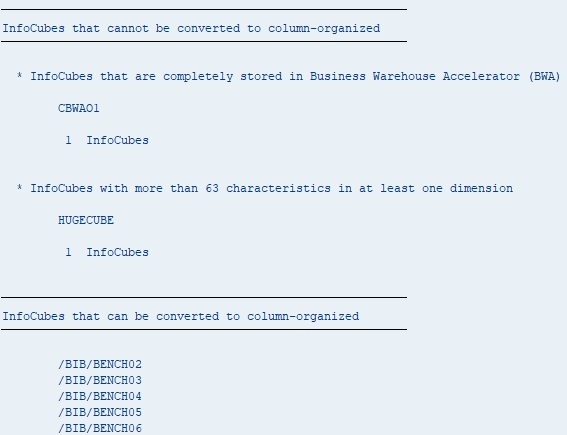 Select why type of BW object you want to check – InfoCube, DataStore object or InfoObject. On the results screen, you will see lists of objects, sorted to according whether they are already column-organized, whether they can be converted to column-organized, or not. Note that the program SAP_BLU_CONVERSION_CHECK_DB6 only does some checking; to convert the objects to column-organized, you use program DB6CONV. The version as of 10.5 now focuses on setting up SAP BW on IBM Db2 with Db2 BLU Acceleration, which we recommend as a standard for Db2-based BW systems. The sections on BLU Acceleration have been slightly updated. The version for 10.1 and lower is now a much leaner document. With 10.1 and lower, you can’t use BLU Acceleration. Therefore, we have removed all the information about BLU Acceleration because it’s not needed. We have updated the hardware and software requirements for the Db2 Database Partitioning Feature (DPF). You will notice that as of Db2 10.5, we highly recommend a single partition with intrapartition parallelism for SAP BW systems, which is sufficient in many cases – no need for partitioning. For more details, check the section hardware requirements in the database administration guide for SAP BW on IBM Db2. What About Mod Pack 3 for IBM Db2 11.1? I guess most of you will have noticed that Db2 Version 11.1 Mod 3 Fix Pack 3 has been released by IBM. We are still in the process of testing Mod Pack 3 for the release by SAP. Watch our SAP Community page for more news.